This new picture of the new Justice League by Jim Lee has been circulating around today. The lineup has been known for some time now, but this is a better look at their modified character designs. Aquaman looks the same as ever and so does Flash and Green Lantern. The one big thing on all these costumes is all the piping that makes it look like they’re wearing some sort of armor. That reminds me of how the DCU characters looked in the Mortal Kombat vs. DC game a few years back. The big three seem to have the most changes. Wonder Woman is still wearing something similar to her recent revamp, except this new look has no yellow or the jacket. She’s also back to her more traditional style books as opposed to the 1980s stirrup biker pants. Also note the lack of American flag motifs, which I wonder (haha!) was a conscious effort to broaden her global appeal. Superman and Batman really look like they bought their costumes together. They’ve both dropped wearing underwear on the outside, and Superman seems to be sporting a utility belt of some sort. Maybe its so he can carry his allergy medicine; I’ve heard pollen is just as bad as kryptonite. And poor Cyborg, well, he looks like he’s wearing Lex Luthor armor. Sorry dude. 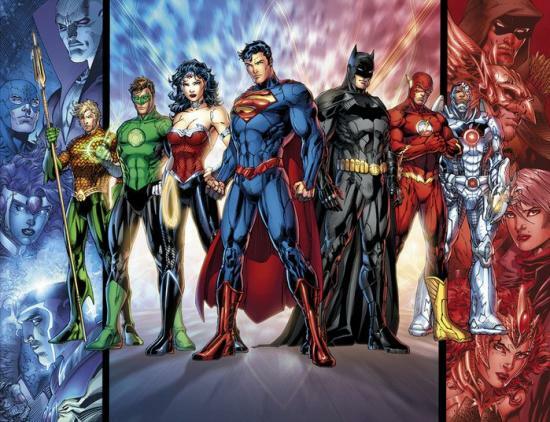 The other interesting thing is that in that picture is that there seem to be other JLA types on either side. In the blue panel, its Deadman, Atom, Element Woman (thank Bleeding Cool for identifying who it was; I had no idea) and Firestorm. For those who don’t know, Element Woman is a new character, pretty much a female version of Elemento, who debuted in the Flashpoint miniseries. I guess she survives it. On the right, a red panel consisting of Green Arrow (you would thin that him being a life-long liberal would put him on the blue/left side ;)), Black Canaray, Hawkman and Mera, Aquaman’s wife. I wonder what the significance of these two groups are; maybe something with the new guard vs. the old guard. Who knows. This entry was posted in Uncategorized and tagged aquaman, batman, cyborg, dc, flash, green lantern, jim lee, justice league, superman, wonder woman by Chris. Bookmark the permalink. I was looking to familiarize myself more with DC and i think this reboot they are doing may be a good thing.Maybe not for the purists but for Marvel heads like me who may want to see what else is out there.I might pick up JL #1.I haven’t collected comics in a while and this may be my starting point.